A wave of global xenophobia reminds us, again, about the fragility of our emotional world: people seem unable to talk to, empathize with, or even see the other. The recent U.S. election has spurred a burst of crisis activism, begging an important question: when should this work be rapid, and when is it better to slow down? Chloë Bass and Naeem Mohaiemen have been discussing forms of political agency invested in smaller units: friends, collaborators, neighbors, families. Drawing from Bass and Mohaiemen's recent works (separately and together), this conversation examines, with the audience, the possibilities of understanding, the aesthetic effects of small acts, and ways to slow down and gently amplify each other. Considering the gendered economy of emotional labor, and the sometimes-forced separations between studio work and direct organizing, how can we open our forms to more possibilities? This event is organized in conjunction with the exhibition Once More, with Feeling (November 11 - December 23, 2016). Join us for a special screening of Zoe Beloff's Charming Augustine (2005), a 3D film inspired by the book Iconographie photographique de la Salpêtrière, a series of photographs and texts on hysteria published by a mental hospital in Paris in the 1870s. An experimental narrative based on the case of a young patient, Augustine, the film explores connections between attempts to document her mental states and the prehistory of narrative film. The screening will be followed with a Q&A with the artist. Zoe Beloff is an artist and Professor at Queens College in the departments of Media Studies and Art. She works with a wide range of media including film, projection performance, installation and drawing. Each project aims to connect the present to past so that it might illuminate the future in new ways. She is currently working on a new project called “Emotions go to Work". Her projects have presented internationally at venues that include the Whitney Museum of American Art, Site Santa Fe, the M HKA museum in Antwerp, and the Pompidou Center in Paris. This event takes place in conjunction with Once More, with Feeling (November 11 - December 23, 2016) at EFA Project Space. Please join for an introductory session of the Emotional Labor Movement with ELU-certified motion therapist Kendra Kambestad. A link to book a 5 minute session will be available on the EFA Project Space site for Once More, with Feeling. This is a chance to dip your toe into your subconscious emotional resources through movement and to improve your skills as a witness to expression. Participants are invited to sign up for a 5 minute session of solo movement, with eyes closed and without choreography, with Kambestad, after which you will be asked to name the emotions you experienced while moving. Kambestad will provide feedback about what she witnessed in your movement and invite you to consider the connection between emotion, movement and body. While awaiting and/or healing from scheduled sessions, participants are invited to enjoy the Emotional Labor Union lounge and literature, engaging in emotional expression by observing others practice and perform their brief movement sessions. These sessions will run from 6:30 - 7:30 pm. Those who are curious about this topic and who would rather not participate in the solo movement are nevertheless warmly welcome! There will be a Union representative present to answer any questions you may have about the ELU as well as participate in movement along side any individual who would rather not move solo. It is advised to come promptly at 6:30 PM no matter your scheduled session time. At the conclusion of these sessions we will come together and discuss the relationship between emotion, movement, body, and the ways in which, by exploring this relationship, one can better understand how emotions take form in ourselves and our lives. Movement, identification, feedback and witnessing are all great tools to heighten awareness of the stages of emotional expression and labor. The ELU believes that greater awareness of process makes for a more empowered emoter, with greater capacity to represent their professional interests effectively. This event is ideal for those interested in joining the Emotional Labor Union and getting a taste of the benefits our organization offers its members. It is also open to ELU members who would like to deepen their emotional resources. Whether your reasons are to increase impact of daily expression, broaden your emotional range, or better understand the science behind the feelings we have this is a great workshop for you! This conversation between Silvia Federici and curator and Laurel Ptak on Wednesday, November 30 explores connections between the International Wages for Housework Campaign and Wages for Facebook. The International Wages for Housework Campaign, founded in 1972, grew out of the International Feminist Collective in Italy, founded by Silvia Federici alongside Selma James, Brigitte Galtier, and Mariarosa Dalla Costa. The Campaign was formed to raise awareness of how housework and childcare are the base of all industrial work and to stake the claim that these unavoidable tasks should be compensated as paid wage labor. Wages for Facebook, founded by Laurel Ptak in 2013, draws on the 1970s feminist campaign Wages For Housework, to think through the relationships between capitalism, class and affective labor that are at stake within social media today. Debated widely in the press, at universities and via social media, the project has framed a broad public conversation about workers’ rights and the nature of labor, as well as the politics of its refusal, in our digital age. Silvia Federici is a researcher, activist and educator. She was born and raised in Italy but came to the US in 1967 on a scholarship to study Philosophy at the University of Buffalo. Since then, she has taught at several universities in the US and also at the University of Port Harcourt in Nigeria. She is now Emerita Professor at Hofstra University (Long Island, NY) and lives in Brooklyn. A veteran feminist activist, Federici’s work is informed by and in dialogue with the many struggles which have animated her career. In her extensive work, Federici has addressed themes of enclosure, colonialism, labour, patriarchy and racism in areas as diverse as the advance of capitalist accumulation, international development policy, the labour of “immaterial workers,” the analysis of social movement strategy and anti-colonial struggle. Laurel Ptak works across artistic, curatorial and pedagogical boundaries to address the social and political contours of art and technology. Her projects are interdisciplinary and discursive in nature and have taken up subject matter including alternative economies, debt, feminism, intellectual property and labor. Ptak teaches in the department of Art, Media and Technology at Parsons, The New School and is Director of the artist-run space Triangle Arts Association in New York City. Katya Grokhovsky presents "Polite, Pleasant, Endearing: The History of the Smile", a performance-lecture, which explores the cultural, personal and historical significance, symbolism and the labor behind a smile, accompanied by a live dance interpretation by Jeremy Olson. Katya Grokhovsky is an interdisicpinary artist based in New York City. She holds an MFA from the School of the Art Institute of Chicago and a BFA from Victorian College of the Arts, Melbourne University, Australia. Grokhovsky has received support through numerous residencies and fellowships including Atlantic Center for the Arts, FL, Studios at MASS MoCA, MA, SOHO20 Gallery NYC, BRIC Media Arts Fellowship, NYC, VOX Populi AUX Curatorial Fellowship, PA, Residency Unlimited, NYC, NARS (New York Residency and Studio Foundation), Santa Fe Art Institute Residency, NM, Watermill Center International Summer Residency, NY and others. She has been awarded the Dame Joan Sutherland Fund, APT (Artist pension trust) Membership, Australia Council for the Arts ArtStart Grant, NYFA Mentoring Program for Immigrant Artists, Freedman Traveling Scholarship for Emerging Artists, Australia and others. Her work has been exhibited extensively. Jeremy Olson performances manipulate, misuse, and subject mundane actions and objects - for example, gesturing, speaking, walking, and tomatoes, ants, Gatorade, and Spandex – to rigorous but incongruous technical systems and procedures, especially those of choreography, law, and scientific visualization. In doing so, these actions and objects become sites for critical analysis as well as play, experimentation, and productive failure, a rehearsal of potential alternative forms and uses. A former dancer and physicist, his work has been exhibited in New York City and internationally, and he has performed with choreographers David Neumann, Trisha Brown, Polly Motley, among many others. He has an MFA from Parsons, The New School for Design and studied physics at Princeton and Harvard. Welcome to a Town Hall meeting hosted by the Emotional Labor Union. This event provides a forum for concerns, questions, and grievances about emotional labor and the state of the emotional economy today. The Emotional Labor Union is a new commission by Megan Snowe. The Union's handbook and history is on view as part of Once More, with Feeling, curated by Chelsea Haines. Union representatives will be be present to moderate the discussion. All are welcome to bring concerns to the floor as well as respond to fellow citizens with advice and reflections. This town hall will be an open discussion format. We want to hear your voices! - How, why and when do you experience emotion? express emotion? - Do you find yourself expressing emotion more at work or not at work? - In what contexts are we asked by a boss, partner, friend or other external force to express or control our emotions? - What do you think your emotional data is being used for? - What is an appropriate use for this data? - What do you consider to be an emotional investment? - What is your desired return on an emotional investment? - How do we gauge emotional impact and value? The Emotional Labor Union exists to protect the rights of emoting citizens, negotiate fair use of emotional information and provide resources for increased emotional awareness, intelligence, agency and regulation. Emotions are capital; emotions are invested; emotions are precious substances formed by extended and repeated internal and external pressures, welling up as information-rich crude, fuel for our emotional economy. Jasmeen Patheja, Indri Pickle Lab, 2016, Video, 8 min. Courtesy the artist. All artists participating in Apparatus for a Utopian Image will be present for the closing reception. Apparatus for a Utopian Image is on view from September 21 - October 29, 2016. Apparatus for a Utopian Image is no ordinary exhibition. It is a game played between two cities, Prague and New York. The purpose of this game is to investigate how we orient ourselves in today’s image-infused reality. We invite your participation. What am I Seeing?, led by Reanimation Library's Andrew Beccone, is a workshop organized around the problem of cataloging images. It is presented in conversation with Apparatus for a Utopian Image, a changing, interactive exhibition exploring how we interpret and associate meanings from the images that surround us. Unlike books, which can explicitly convey their subject matter through their written content (and can be cataloged relatively easily because subject headings are comprised of written language), image cataloging requires an extra step—the translation of a given image into a written description. This becomes even more difficult when you aren’t sure what you are looking at—an experience not uncommon in (though certainly not limited to) the world of Contemporary Art. Using content taken from the shelves of the Reanimation Library, the participatory workshop will offer insight into library cataloging practices and of the theoretical foundations of classification systems, with special attention paid to their inherently subjective and political nature. Seating is limited to 20 people. RSVP to meghana@efanyc.org by 9/30. The Reanimation Library's collection—simultaneously prosaic and peculiar—consists of relics of the rapidly receding 20th century. Chosen primarily for the images that they contain, they have been culled from thrift stores, rummage sales, flea markets, municipal dumps, library sales, give-away piles, and used bookstores across the country. Andrew Beccone, an artist, librarian, and musician, is the founder of the Reanimation Library. The library has been exhibited widely at venues around the world including Vox Populi (Philadelphia), SPACE (London), High Desert Test Sites (Joshua Tree), talcual (Mexico City), 98weeks (Beirut), the Museum of Modern Art, the Queens Museum, and Kunsthalle Osnabrück. This event is in conjunction with Apparatus for a Utopian Image, on view from September 21 - October 29, 2016 at EFA Project Space. From August 12 - 28, 2016, the SHIFT residents have taken over EFA Project Space, transforming the 3,000 square foot gallery into a collective laboratory for pushing their practice in new directions while garnering support and feedback from their colleagues. After this intense incubation period the residents will continue to meet monthly, concluding with a final retreat and an exhibition in EFA Project Space in June 2017. Learn more about SHIFT Residency here. How do you get from here to there? In How do you get from here to there?, Marissa Perel explores the dynamics of choreographed reading. Situating their bodies in relationship to selections by Gregg Bordowitz, Corrine Fitzpatrick, and Maggie Nelson, through an arrangement of isometric materials and lights, Perel and dancer, iele paloumpis, find ways of assisting one another, exchanging weight, abilities and intimacies. The performance investigates deviation of the queer and crip body from normative senses of time, space, and mastery. Angela Dufresne took Kerry Downey on a fishing trip upstate in Spring 2015. Downey’s subsequent performance explores the relationship between fishing and painting practices. They engage with the layered histories of mimicry through queer, feminist, pedagogical, painterly, and performative practices. Using an overhead projector, Downey attempts to copy Dufresne’s gestures, words, and ideas. The performance brings the politics and poetics of cross-generational exchange into close proximity. Angela Dufresne is an artist who makes paintings, drawings, and videos. She was recently awarded the 2016 Guggenheim fellowship. Dufresne is currently Assistant Professor of painting at RISD. These performances take place in conjunction with NO ATLAS, an exhibition produced by EFA Project Space's 2015/16 SHIFT Residency artists. NO ATLAS is produced by our 2015/16 SHIFT Residency artists. The unique nature of SHIFT Residency draws out unspoken challenges and considerations in the lives of its participating artists, who dedicate a significant portion of their time towards supporting other artists. Reflecting possibilities for navigating otherness at the intersection of time, place, and identity, the work in NO ATLAS maps territories known and unknown, real and imagined, material and spectral, playing out each artist's relationships to alterity. The group collectively examines modes of displacement, using video, sculpture, installation, and performance as tools for investigation into origins, cosmologies, pedagogies, and the shifting dimensions of interpersonal relationships. All artwork and programming presented for NO ATLAS has been conceived of and created by the artists since they began the SHIFT Residency in August 2015. This event is being held in conjunction with the exhibition NO ATLAS, on view June 10 - July 9, 2016. A Certain Urge (Towards Turmoil) exists along a fault-line of shaky utopian dreams. Rising from anxieties caused by the perpetual possibility of societal disaster, the show reflects on a past and present connected through turmoil. These artists employ poeticized tactics of disruption to draw out hypocrisies within dominant sociopolitical systems, and undermine the tight grip of political dogma. Active agents in their local communities, while contributing to essential international discourse, the artists are in dialogue with each other as they present previous work alongside work created for the exhibition. Through sculpture, installation, performance and intervention, A Certain Urge (Towards Turmoil) evokes a space to imagine versions of the world yet unattained. This event is being held in conjunction with the exhibition A Certain Urge (Towards Turmoil), on view March 24 - May 7, 2016. In collaboration with WhiteBox, EFA Project Space presents a panel discussion with the artists and organizers of the current exhibition, A Certain Urge (Towards Turmoil). This event is organized in conjunction with A Certain Urge (Towards Turmoil), on view from March 24 - May 7, 2016 at EFA Project Space. Shane Aslan Selzer will engage audiences through a free-­form creative play session for families with young children, centering on an open­-ended exploration of materials, form, and color. We recommend that children come in clothing they can get paint on. RSVP by Friday, March 4 to meghana@efanyc.org. This presentation is made possible in part with public funds from the New York State Council for the Arts' Electronic Media and Film Presentation Funds grant program. This event is in conjunction with The Let Down Reflex, on view from January 30 - March 12, 2016 at EFA Project Space. Wah-wah, shh, chomp, munch, nom, burp, poot, slurp, yum, toot, mwah. But who's holding the baby? Wah-wah, shh, chomp, munch, nom, burp, poot, slurp, yum, toot, mwah. But who's holding the baby? is an open forum which aims to create a space for exchange where structural questions at the intersection of the art worker, contemporary work conditions, and social reproduction are discussed. Founded by artists, writers, critics, and museum staff in New York in 1969, the Art Workers' Coalition advocated for a redefinition of the artist as worker. Its principal mandate was to pressure institutions to implement economic and political reforms. While we have a system that ascribes value to waged work performed by workers, the social importance of care work and reproductive labor is often unwaged and obscured. Marginalized strands of the second-wave feminist movement, such as Wages for Housework, advocated for salaried domestic labour. However, their demands were often ostracized by the prevailing brand feminism in the 1970s, which was preoccupied with gaining equal opportunity in the labor market and gaining equal status with men. As observed by Nancy Fraser, "second-wave feminism has wrought an epochal cultural revolution, but the vast change in mentalités has not (yet) translated into structural, institutional change." In this open forum, we hope to envision structures for arts institutions and organizations so our needs to alleviate housework would be met and served. Four themes are proposed and led by moderators in smaller conversation groups. Bring your thoughts, ideas, and knowledge to the table, and let's collectively think how domestic and affective labor, such as cooking, childcare, and care work, are integral to our experience. 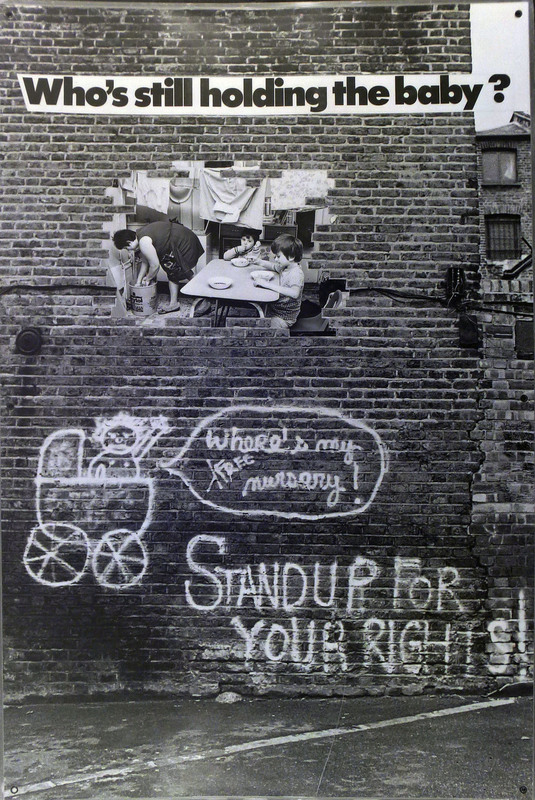 Formed in London in 1974, the Hackney Flashers was a women's photography collective concerned with childcare provision for all women. They used agitprop (the tools of photography and drawing along with copy) to draw attention to questions of social reproduction and labor for women. The resulting works were exhibited and traveled between women's centers, trade union events, and libraries to provide information to women about the issues which made their lives dire, while equipping them with tools to fight against the foe. Under the pressures of today's neoliberal economy, how can we imagine childcare models that would accommodate art workers who are parents or guardians? This discussion group invites participants to imagine models for childcare adapted to our work conditions, while looking at contemporary and historical examples of childcare. Jacqueline Hoàng Nguyễn is an artist and her sound work The Wages Due Song is included in this exhibition. As arts institutions grow increasingly interested in making their spaces and programs accessible to cultural workers raising children, the creative thinking of parent-artists can help shape the art world we want and need. Looking to certification models like LEED (environmental design) and W.A.G.E. (artist compensation) we will propose new standards and utopian visions while considering the practical realities of venues from grassroots artist projects to well-established museums. Christa Donner is an artist, curator, and founder of Cultural ReProducers, an evolving creative platform and community-based project supporting arts professionals raising children. Without the help of the 2.5 million paid careworkers across the United States and 200,000 in New York City alone, most of us could not go to work or have leisure time. While this growing workforce comprised of predominantly immigrant women of color serve as doctors, teachers, and companions to our loved ones, the majority struggle to put bread on their own tables. At the same time, families across the United States and especially New York City struggle under the staggering cost of care, leaving parents/guardians to make difficult decisions that disproportionately affect women who shoulder the burden of carework. Diversity within cultural and public service sectors are impacted when the rising cost of care means that creative individuals cannot afford to participate. If we recognize that strengthening the rights of women, maintaining artistic diversity, and expanding quality care options is necessarily coterminous with the socio-economic advancement of domestic workers, what specific tools and memes can we design to more efficiently communicate this principle of fair care = quality care? What are the specific touch points within the flows of existing institutions or within the lives of care consumers (domestic employers) where these tools can be deployed? Marisa Morán Jahn is the founder of the non-profit Studio REV- and lead artist of the CareForce, a public art transmedia project (and mobile vehicle, the “CareForce One) exploring America’s fastest growing workforce — caregivers. Cooperative daycares, kitchen-less houses, and rotating dinner clubs were some of the economic and urban design models developed by the late 19th Century material feminist movement, as documented in Dolores Hayden’s architectural history book, The Grand Domestic Revolution (1981). But the failure of the material feminists to connect their struggles beyond their white, middle/upper class realities have striking resonance today, especially in the context of globalized care chains and the struggles for rights by migrant domestic workers, who leave their own families and homes to take care of richer ones. Departing from the blind-spots to such inequalities reproduced through traditional and alternative care economies, this discussion will explore the potential for creating a collective food making and food sharing practice; one that can attend to different bodies, cultures, histories, and ingredients - in all their differing privileges - as connected to local and global economies of care. Maiko Tanaka is a curator who worked on the Grand Domestic Revolution from 2010-2013 with Casco - Office for Art Design and Theory, in Utrecht and is currently collaborating on Gendai Kitchen in Toronto. This presentation is made possible in part with public funds from the New York State Council for the Arts' Electronic Media and Film Presentation Funds grant program, administered by The ARTS Council of the Southern Finger Lakes and Women and Performance: a journal of feminist theory. In a staged performance with a live audience, artist Dillon de Give and his 2-year-old son Peregrin collaborate in an attempt to recreate a typical going-to-bed routine, possibly with Peregrin going to sleep. This performance takes place in conjunction with The Let Down Reflex, on view from January 30 - March 12, 2016 at EFA Project Space. Opening reception Saturday, Jan 30, 2 - 4 pm. Families and children are encouraged to attend. This event is being held in conjunction with the exhibition The Let Down Reflex, on view January 30 - March 12, 2016. The Let Down Reflex is an exhibition that attempts to recognize the complexities of parenting in the art world, and asks if a better alternative for families can exist. Calling out a slippage in today’s feminist art world, the curators summon a group of artist-parents to contribute to a springboard for re-imagining an art world where “Mom” is not a demeaning characterization, where childcare is factored in for participating artists at art spaces, and where artists aren’t forced to choose between home and work because of a lack of parental leave. The “let down reflex,” a term referencing the involuntary reflex that causes nursing mothers to produce breast milk, takes on a double meaning in this exhibition, referring here to the reflexive tendency of letting down parents, and particularly mothers, within the flawed labor system of the art world.